Born on 22 September 1833, in Charleston, South Carolina, Stephen Dill Lee was the first child of Dr. Thomas Lee Jr. and Caroline Allison Lee. His mother died in 1835, shortly after giving birth to Caroline Kezia Rachel Lee, and Stephen and his sister were raised by their financially unsuccessful father and his second wife, Elizabeth Cummings Humphreys Lee, whom he married in 1839. In part as a consequence of the family’s financial situation, Lee received his early formal education at a military boarding school run by the uncle for whom he was named. He later secured an appointment to the US Military Academy, graduating in 1854. Lee served in the US Army for nearly seven years and saw action in Florida in the Third Seminole War and along the Kansas-Missouri border. On 20 February 1861, following the secession of several southern states, he resigned from the army and was commissioned a captain in South Carolina forces and later in the Confederate Army. Lee first served as an aide-de-camp to Gen. P. G. T. Beauregard in Charleston, and on 11 April 1861 he delivered an ultimatum to Union major Robert Anderson demanding the evacuation of Fort Sumter. When the demand was refused, South Carolina troops fired on the fort and civil war began. Lee served as an artillery officer in the early campaigns of the war in Virginia and Maryland. In action at Seven Pines, on the Peninsula, at Second Manassas, and at Antietam, he exhibited personal bravery and exceptional skill. Lee rose steadily in rank and on 6 November 1862 was promoted to brigadier general and sent to the fortress city of Vicksburg, known as the Gibraltar of the Confederacy. In December 1862 Lee commanded the Confederate forces that defeated William Tecumseh Sherman’s US troops along the banks of Chickasaw Bayou, north of Vicksburg. He led a brigade of Alabama troops throughout the Vicksburg Campaign and during the siege of the city, which surrendered to Ulysses S. Grant on 4 July 1863. Following his exchange, Lee was elevated to major general on 3 August 1863; on 23 June 1864 he received another promotion, becoming the youngest Confederate lieutenant general. Given command of John Bell Hood’s old corps in the Army of Tennessee, Lee fought valiantly in the battles around Atlanta and in the disastrous Tennessee Campaign. During the retreat from Nashville, Lee’s corps served as the army’s rear guard and clashed frequently with the enemy. On 17 December 1864, while in action along the Harpeth River near Spring Hill, Tennessee, he was wounded in the foot. After being taken to a hospital in Florence, Alabama, Lee was moved to the home of his fiancée, Regina Harrison, in Columbus, Mississippi, and they married on 9 February 1865, during his convalescence. He rejoined the army under Joseph E. Johnston in North Carolina and served with distinction for the remainder of the war. He and his wife subsequently moved to Devereaux, a 770-acre plantation in Noxubee County that the couple received as a wedding gift from Regina Lee’s grandfather. Although his duties at the college were demanding, Lee remained active in politics and was a delegate to the convention that drafted the state’s 1890 Constitution. He also pursued interests in other fields and served as president of the Mississippi Historical Society. He slowly became interested in honoring his fellow veterans, and his efforts to serve them soon became a passion that dominated the last twenty years of his life. In 1895 he became president of the Vicksburg National Military Park Association, which sought to secure congressional establishment of a national military park at Vicksburg. In February 1899, when Pres. William McKinley signed the bill creating the park, Lee was appointed to the park commission. Elected by his fellow commissioners as chair, Lee served in that capacity until 1901. After Regina Lee’s death on 3 October 1903, Stephen Lee devoted his remaining energies entirely to honor veterans who had fought in the Civil War. In 1904 he was named commander in chief of the United Confederate Veterans. On 22 May 1908, shortly after speaking at a reunion of Union veterans in Vicksburg, Lee suffered a stroke, and he died on six days later. 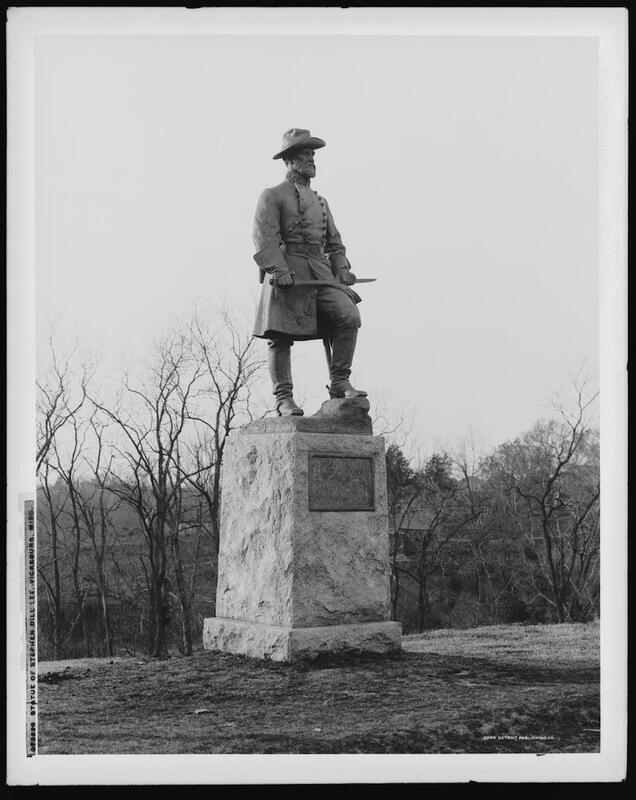 On 11 June 1909 a standing statue of Lee, sculpted by Henry Kitson, was dedicated on the grounds of the park at Vicksburg.